It seemed as though the Universe smiled upon us recently when it brought us a gift: a gift we’d be crazy to pass up. 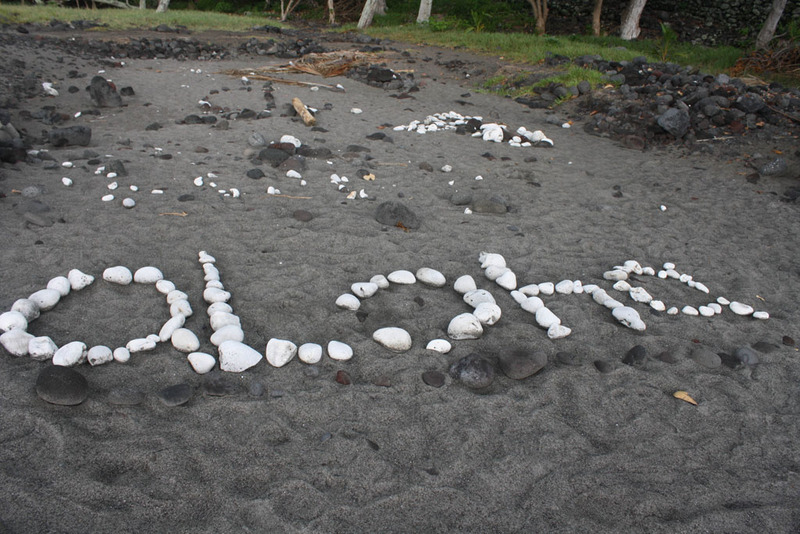 Some friends of ours invited us to join them on their Hawaiian vacation. They already booked the car and condo and all Michael and I had to pay for was our airfare. How could we pass on a Hawaiian vacation deal like that? Of course we said yes! I packed my sunscreen, a pile of books, flip flops and my swimsuit and I was ready! 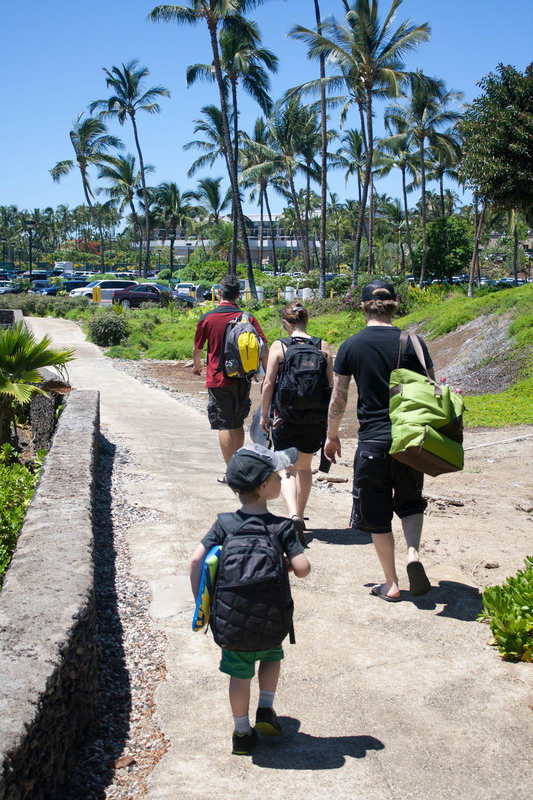 Our friends, Mike and Susanna and their 4 year old son Hans were wonderful travel buddies. They flew in from Seattle to Kona and Michael and I met up with them. When our plane left from LA, I missed the opportunity for an amazing photo–it was probably one of the coolest things I’ve seen: a bunch of jumbo jets taking off from LA, rising above the ocean and the beaches into the clear blue sky right out our plane window. 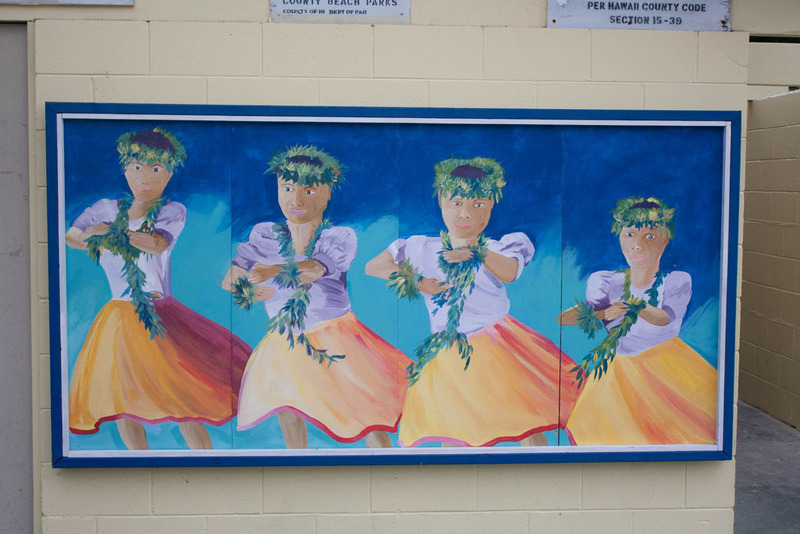 I’m going to write only a few posts about Hawaii and give you guys the highlights. It was a wonderful vacation and also the longest vacation I’ve ever taken (beside England over a decade ago). The timeshare condo we stayed in was very nice and had two separate pools, a very small gym (but it was better than nothing) and it was near the downtown touristy area. We bought tons of food and made most of our meals at the condo, which saved a bunch of money. Michael and I had never been to Hawaii. 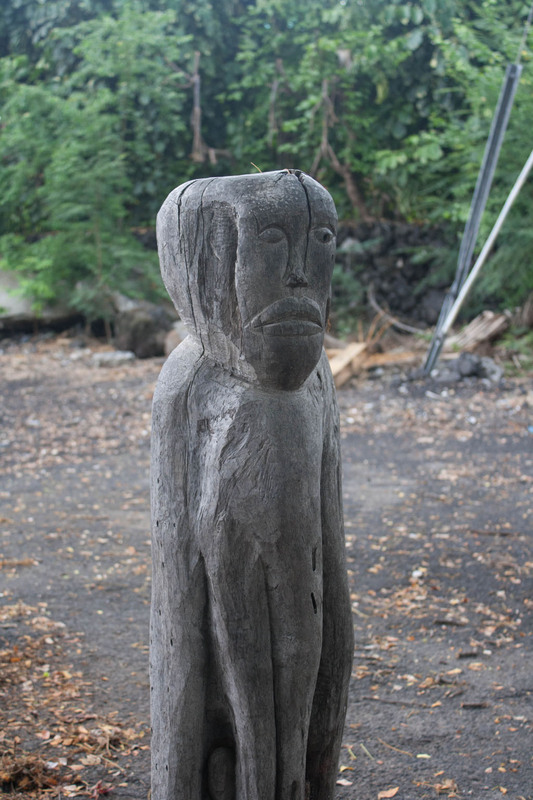 The Kona airport was strange. We walked off the plane, down some detachable stairs and onto the airport itself. It was all open so you were sitting outside in the humid air surrounded by palm trees while you waited for your flight! Our friends picked us up and we went out to dinner immediately. After eating crappy airport food all day I wanted something GOOD. The sun was close to setting that Friday night. 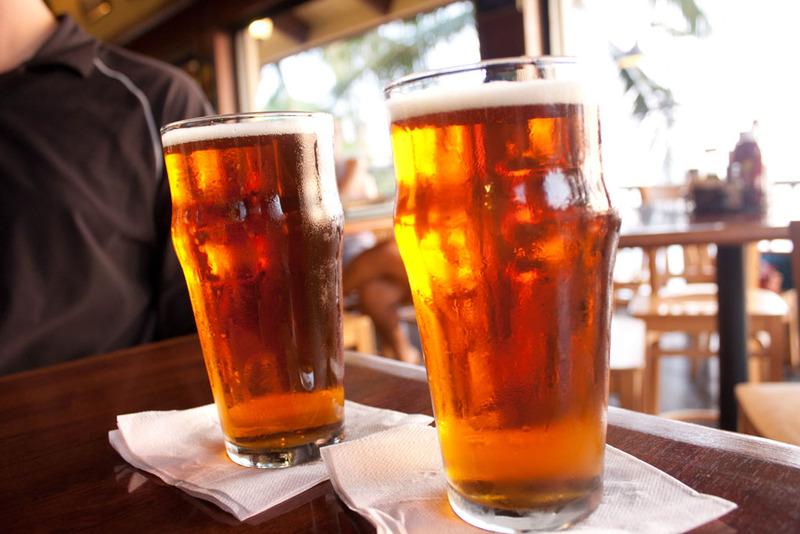 We ate at Humpy’s Big Island Alehouse. 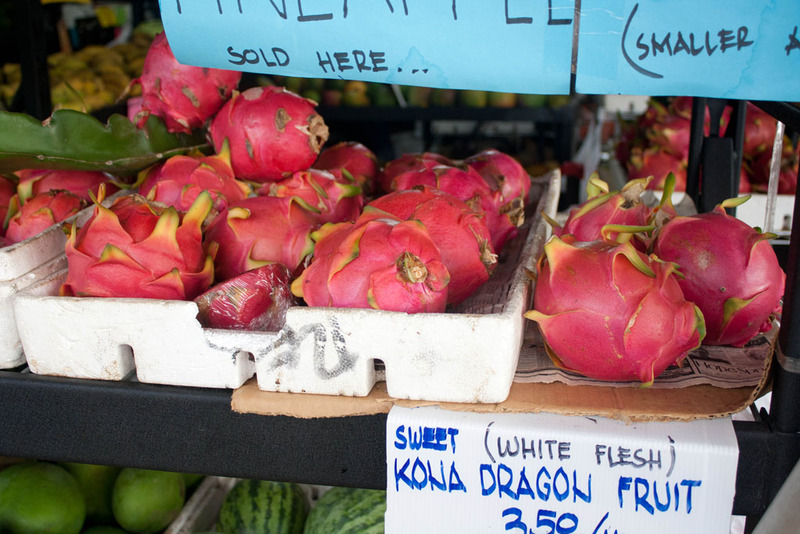 My goal in Hawaii was to eat as much “local” food as I could. 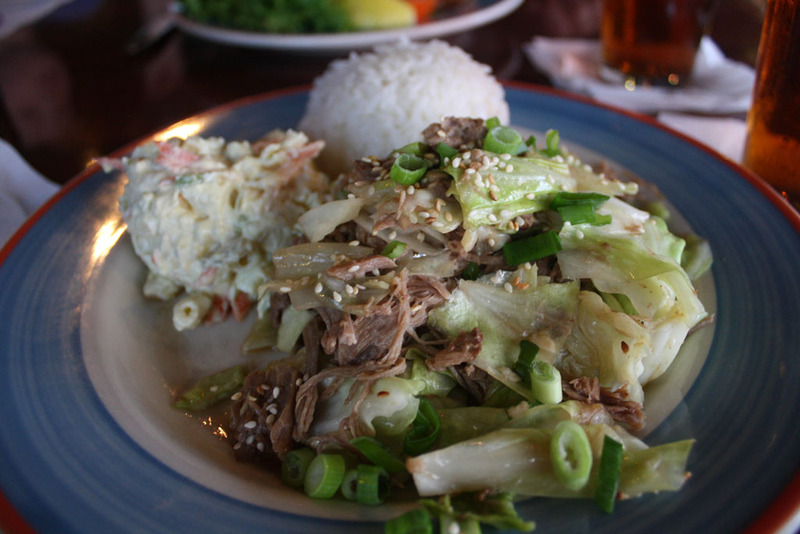 That first night I ordered a Kalua Pork entree and it was one of the best things I’ve eaten in a long time. It was my first time trying it and boy was it a treat: pork shoulder roasted in a pit underground with shredded cooked cabbage and rice. The flavors were outstanding and I was so glad I tried it. Michael got the daily catch (don’t remember what it was now but it was a local fish we’d never heard of). Michael and I both got a Kona Castaway IPA with dinner. We both remarked “it tastes like home.” 😉 We watched the sun set on the ocean while we ate our delicious Hawaiian dinner and then went to the grocery store (talk about sticker shock! Holy crap groceries were expensive there). 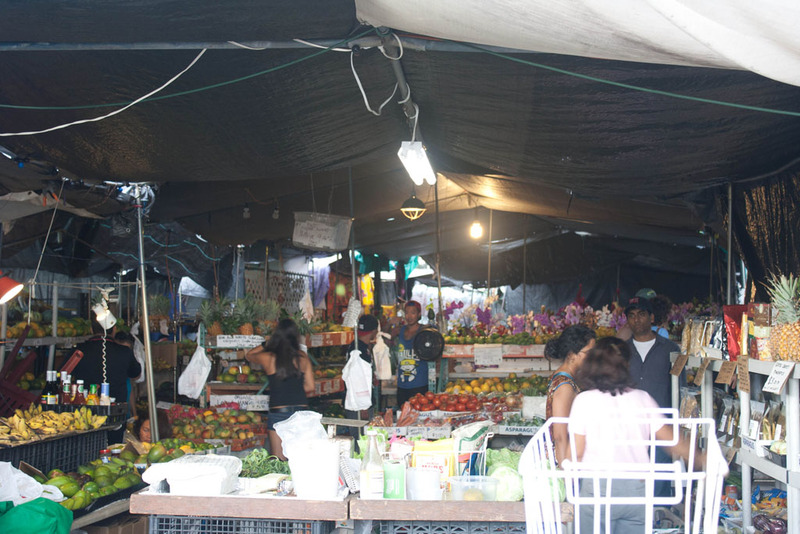 The farmer’s markets that were all over were great places to get fresh produce at a much cheaper price than the grocery stores. The next day was a busy one. I woke up early (no alarm needed) and no one else was up so I went for a run. The sun had only been up for a little bit but it was HOT one. The entire trip the weather was between 80-95 degrees but the heat wasn’t too bad. The hard part was the humidity. It was the most humid, muggy place I’ve ever been. I was just always “wet” feeling. It wasn’t too miserable, though. Back to my run. I ran probably the best I’ve ever run while on vacation. The weather was perfect running weather and in the morning there was usually a cool breeze as I ran along side the ocean. In case you didn’t know, Kona is the home of the Ironman competition so there were TONS of runners and cyclists out there (and they were good too!). I lost count of how many professional runners with completely ripped abs ran by me. Impressive and motivating. It made me really want to get back into running again. My first run of the trip was 40 minutes and I burned 341 calories. I felt really good during my entire run and it was cool to run without headphones or worrying about mileage. I had the ocean to keep me company. I explored the area and just took in all the new sights and sounds. After the run, we made lunches to take to the beach. We ended up going to the wrong beach for the first one. I still don’t know which one we ended up at but it was near the Hilton Waikoloa Village. The beach was gorgeous and looked like a postcard, but it was rocky and not a good place to swim. We sat on the beach and ate our lunches and then took off shortly after that in search of the beach we were trying to go to (more on that later). 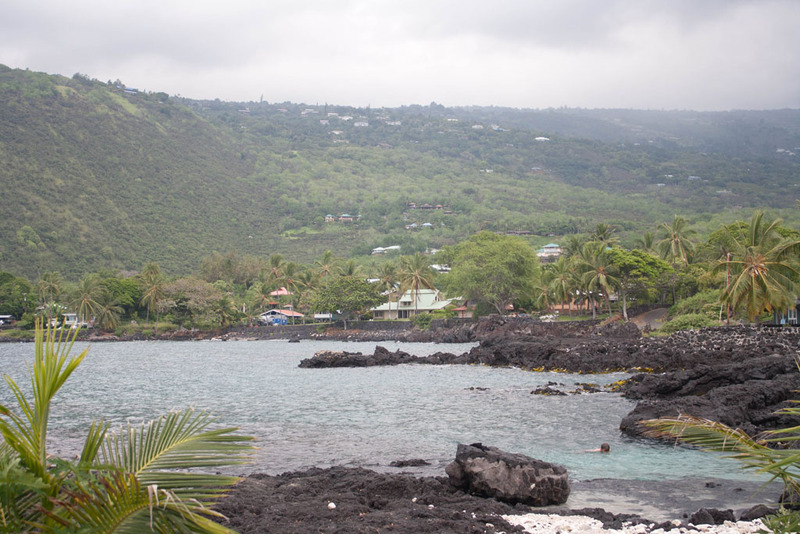 On Day 3, we drove out to Manini Beach for a picnic lunch. It was a long drive through winding roads and jungle-like terrain. 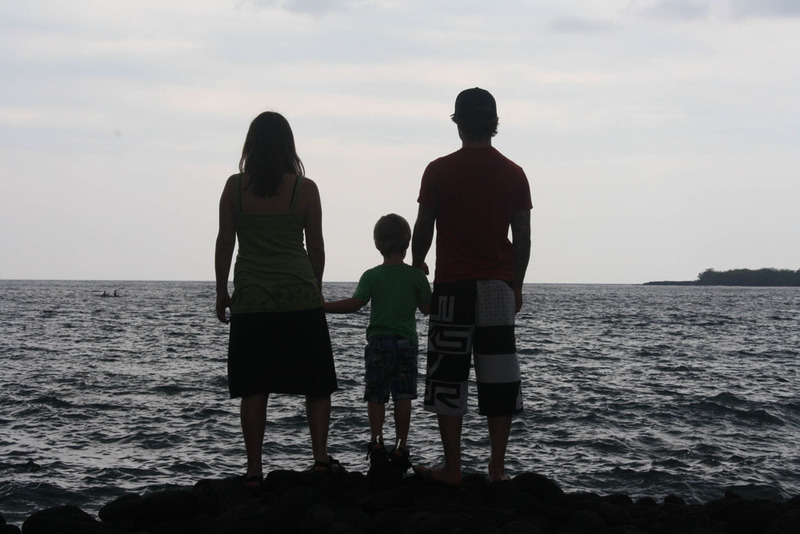 It was kind of how I picture Costa Rica to be. 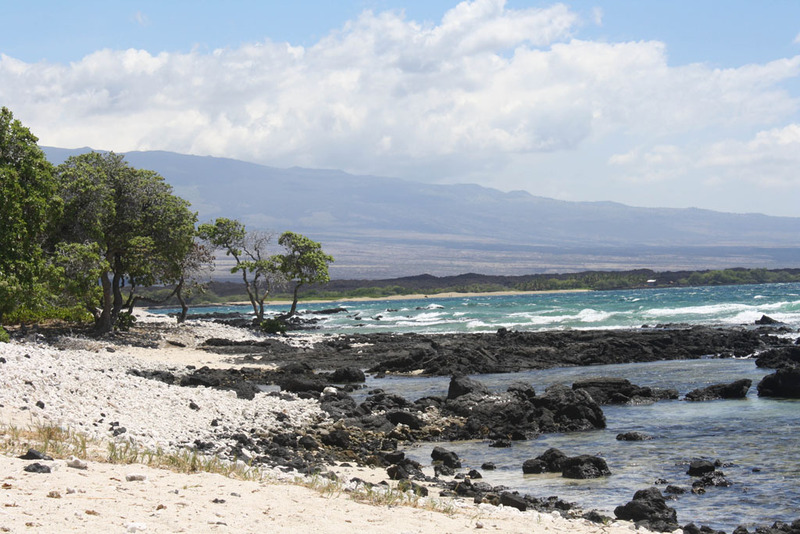 Michael commented on the drive to the beach that it felt like Jurassic Park had been filmed here. That’s kind of what it looked like! The beach itself was rocky but there was some sandy areas for the kids and lots of soft grass to sit on. I enjoyed just hanging out and relaxing while we ate our sandwiches and fresh local watermelon. We were surrounded by the cliffs and the ocean around us. The weather was little gray that day and ended up being the one day we got rain. 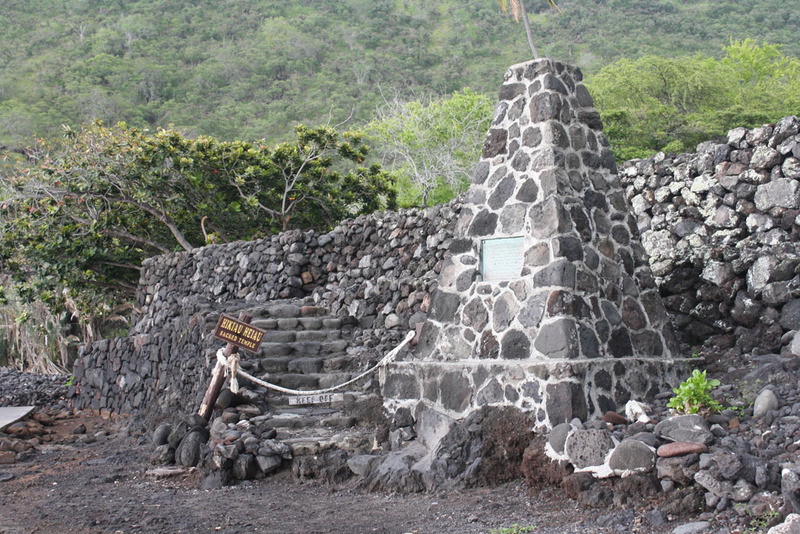 And then walked over to the Hikiau Heiau temple near Manini Beach. It had the remnants of an old temple that is now an official monument. We walked around a bit and then some local guys offered us coconuts they just plucked from the trees. 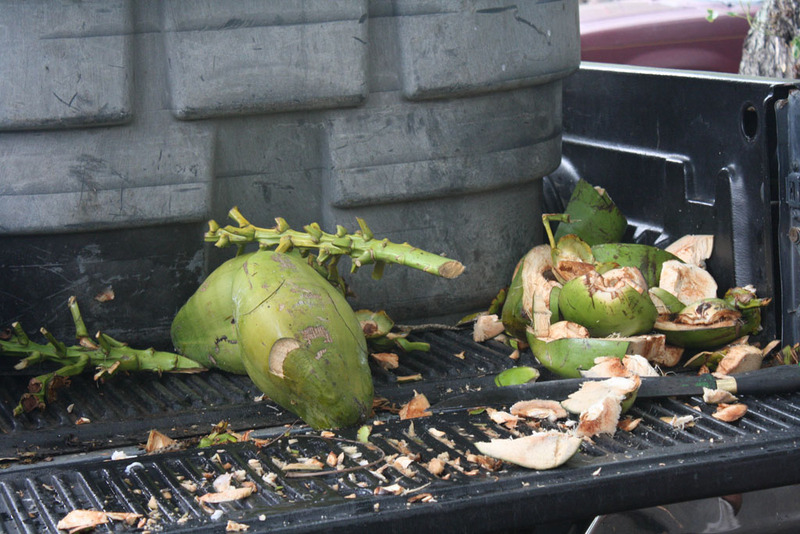 He hacked up a coconut with a machete on the back of his trick and poked a hole in it, letting us drink the fresh coconut water. WOW! So much better than anything I’ve bought in a store. It was truly wonderful. The stop after the beach was to the Greenwell Coffee Farm. Mmmmm Kona Coffee! The coffee farms were up on the huge crest of the mountain (I think 3,000 feet up?). I’m not entirely sure of what the area was called but it was high up and we learned that it rained every single day there. 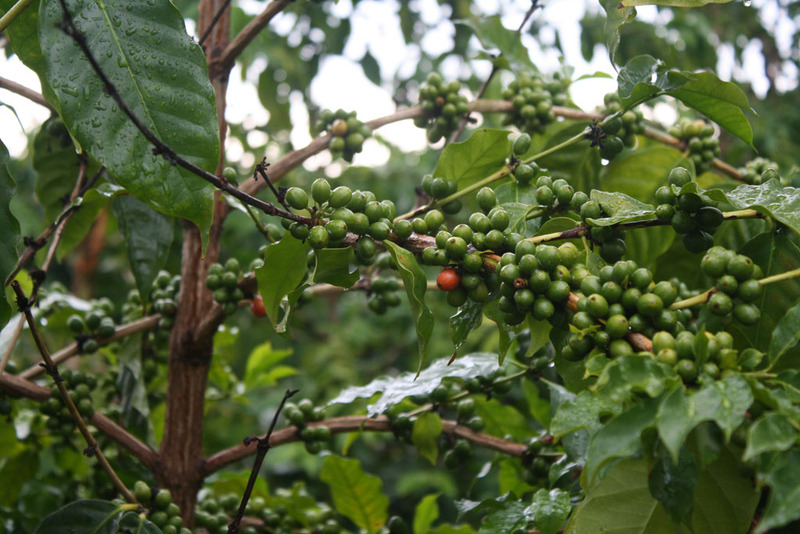 The tour guide at the coffee farm explained that the mornings were always hot and sunny and the afternoons rained. Every day. Crazy. We did the coffee tour, had the samples, and learned how coffee was grown and made (I honestly had no idea and it was pretty fascinating). Our day ended with sushi for dinner. A friend had recommended Sushi Shiono and I am so glad we went. 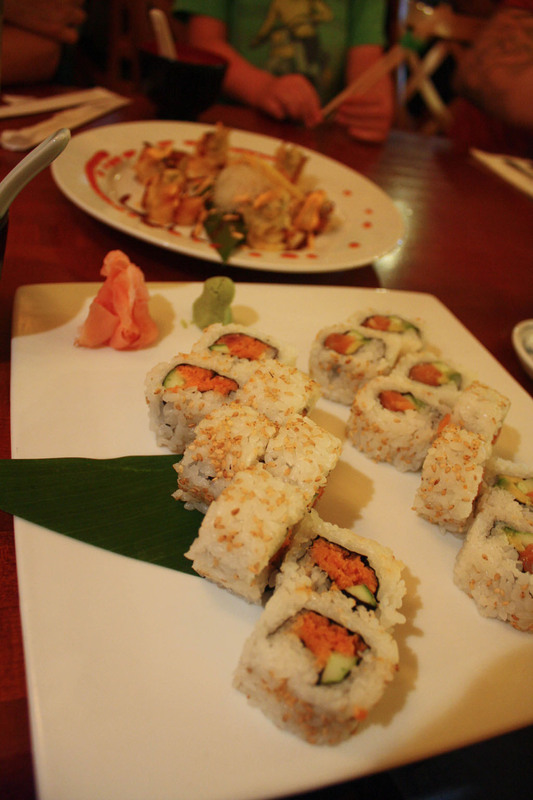 It turned out to be one of the best sushi meals I’ve ever had. 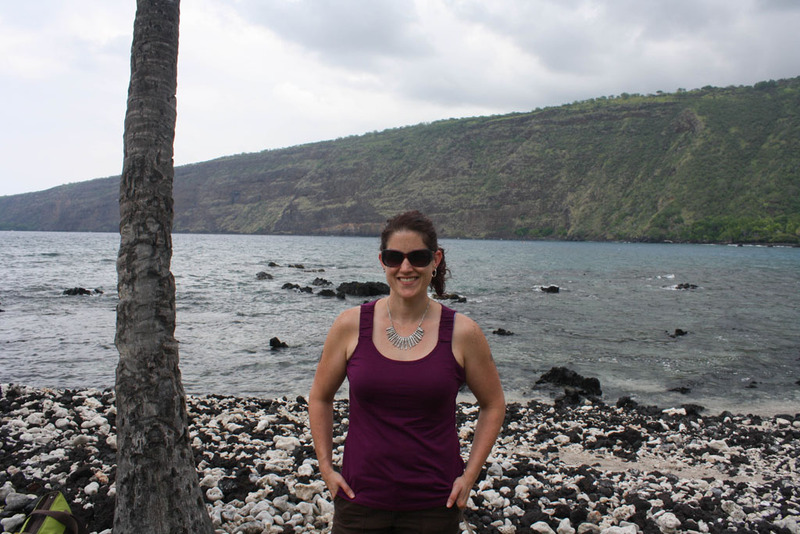 I thought the Northwest had amazing sushi…I was blown away by all the seafood in Hawaii! The sushi was fresh and delicious and it was also super affordable–something you don’t see in Hawaii. Michael and I started with Miso soup and then shared the spicy tuna roll, the salmon roll and then the philly fry roll (deep fried philly roll)! 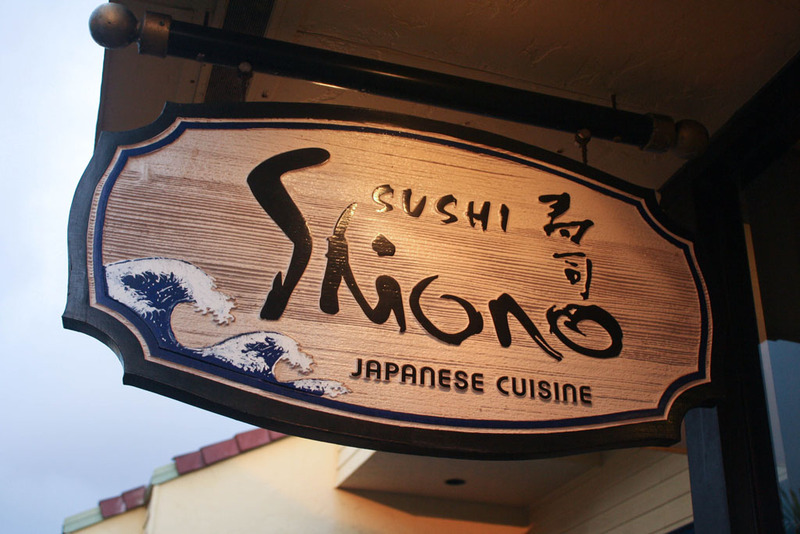 Seriously, if you ever make it to Kona, get sushi here. You will not be disappointed. Another good sign: the clientele was about 95% Japanese. That’s a great sign of GOOD, authentic sushi if you ask me! 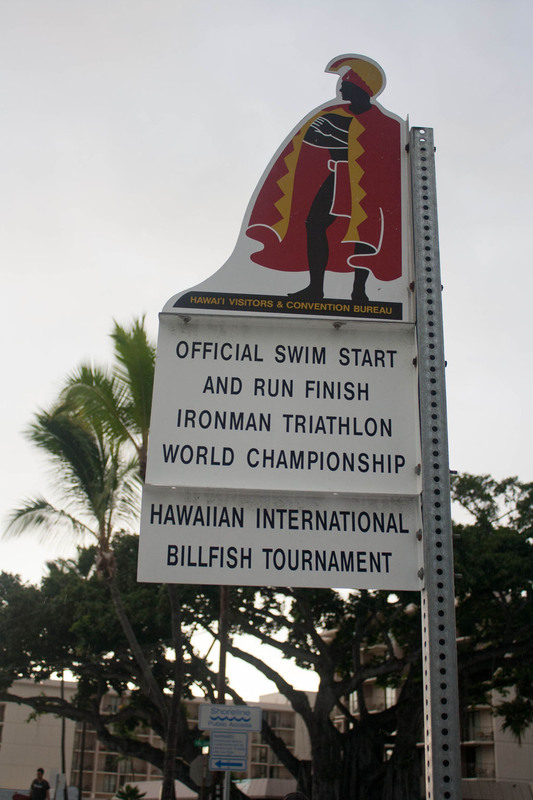 My next post will be about the beaches, the swimming, the running…Hawaii was such a wonderful place for outdoor fitness! 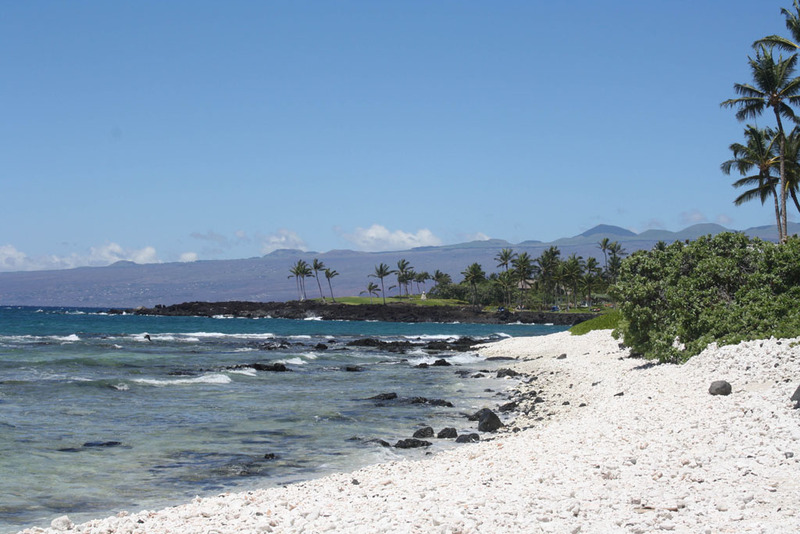 QUESTION: Have you been to Kona? What were your favorite things there? 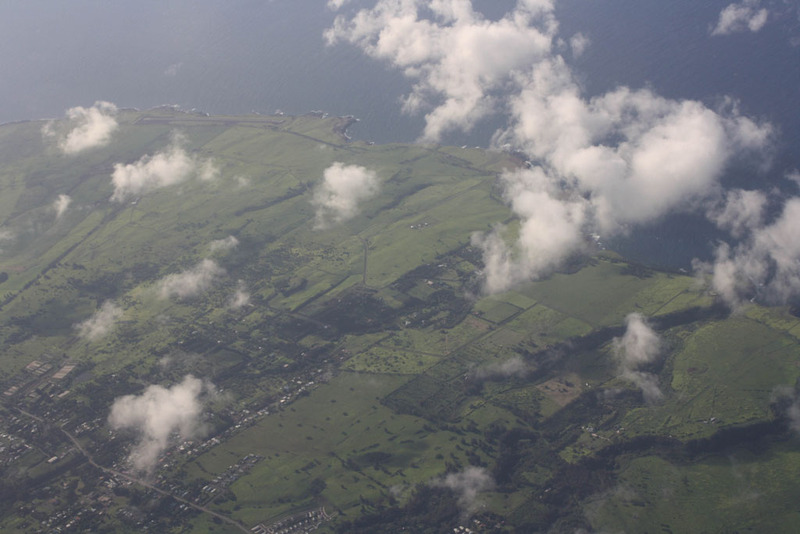 I want to go to Hawaii so badly!! You know I hate you right? OK good. I know! I’m so sorry! I wish everyone could go to Hawaii. Laying on the beach and swimming in the ocean is so wonderful. Thanks Roz! Glad you liked my photos. I have always wanted to go to Hawaii. In fact, as a kid I would often tell people that I planned to retire there! Someday, I hope to go. 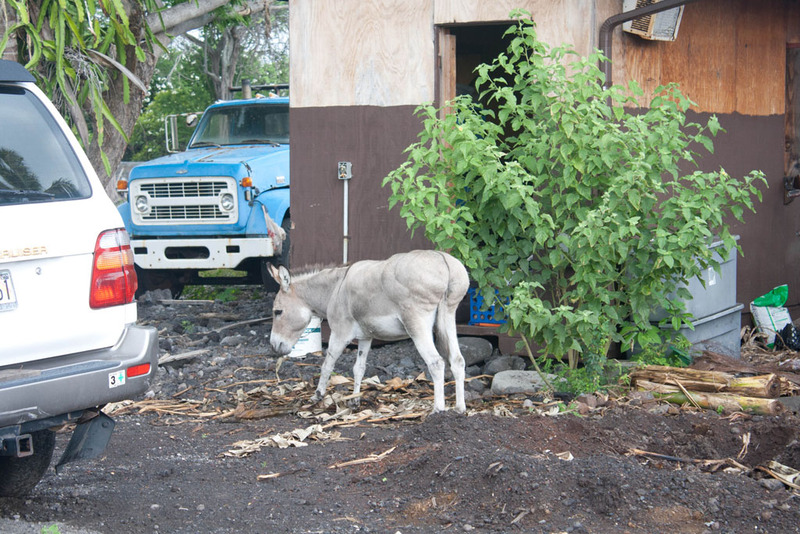 I love everyone’s recaps – the fresh fruit, the coffee, the waters, the donkeys in people’s yards :). It all seems like paradise! I’m so glad you had a wonderful time and what a great deal to be able to go and piggy back with some friends!! That’s a great goal. I think you’ll have to win the lottery to retire there though. Oooof it was expensive! I’m so jealous! These photos are stunning! What a wonderful opportunity! 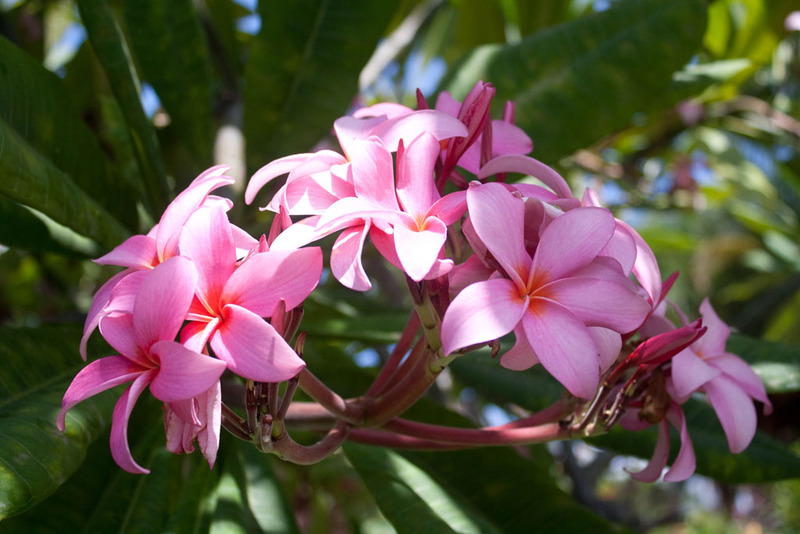 My mom brought me back Kona coffee when she went there with her sister – it was so good! 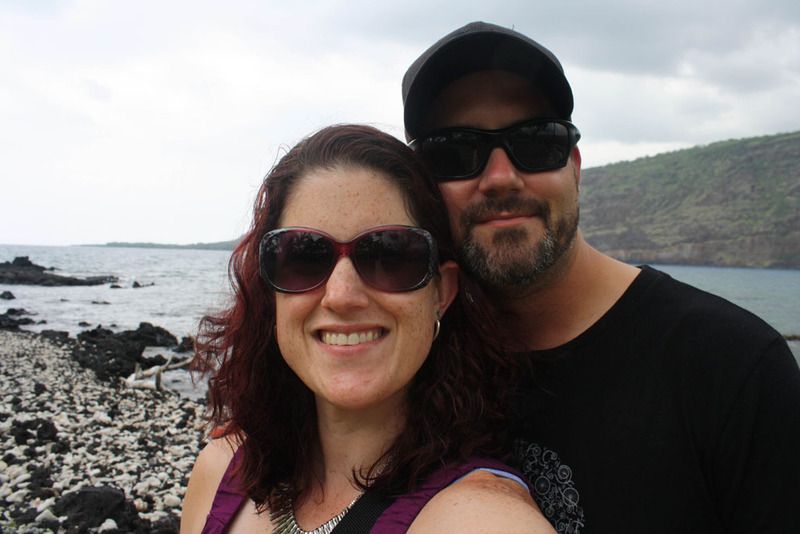 Never been to Hawaii – and my husband has no interest – too long of a flight for him! Biz recently posted..I jinxed myself. It was a very long flight but not as bad as going to Europe. 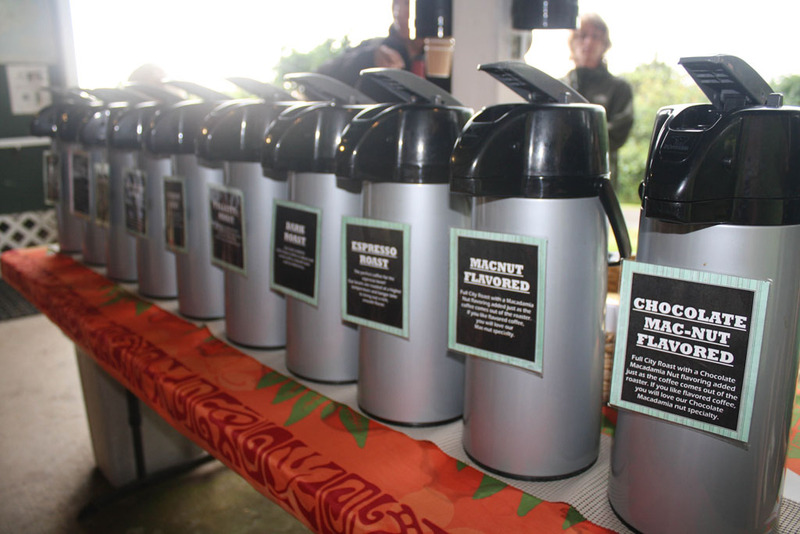 Kona coffee is fantastic, isn’t it?